The Tri-Service Families’ Transition project ran from October 2016 – October 2018. Aware of the growing interest in transition and aware of the lack of specific research into the impact of transition on family members, the Families Federations successfully bid for funding from the Forces in Mind Trust (FiMT). They each appointed a Transition Liaison Manager who undertook research to better understand families’ experiences of transition and make recommendations for the support they need. The managers carried out an evaluation of services, online survey and case studies with families. They liaised with many service delivery and policy making organisations during the course of the project, both to share best practice and findings and to influence developments in transition policy and practice. A shift in culture (for policy makers, service providers, Service leavers and families themselves), which better appreciates the breadth of transition and the need to engage with it from an earlier point in a Service leaver’s career. Raising awareness of the importance of advance planning. An education piece to cover transition entitlement and processes. Tailoring support to families’ specific needs. 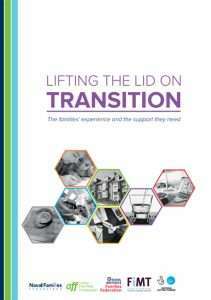 The report, the first to specifically look at the lived experience of Service families, reveals the complex nature of transition and affirms the six ‘elements’ of transition: housing, health, education and children, employment, finances and wellbeing. Our infographic summarises the main findings of the survey. The evidence we have collected, and experiences that families have shared with us, have contributed to the information and advice on these pages.